Gfk Consumer Confidence came as expected and now eyes will be on the US ADP Employment Change. 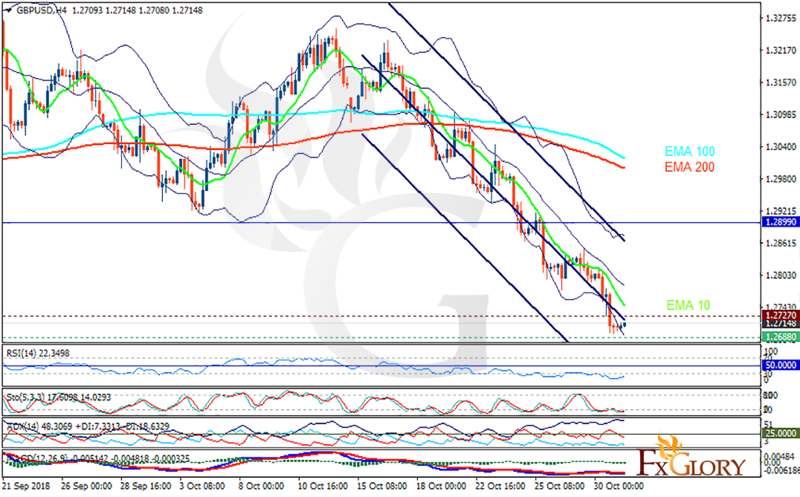 The support rests at 1.26880 with resistance at 1.27270 which both lines are below the weekly pivot point at 1.28990. The EMA of 10 is moving with bearish bias in the descendant channel and it is below the EMA of 100 and the EMA of 200. The RSI is moving in oversold area, the Stochastic is moving in low ranges and the MACD line is below the signal line in the negative territory. The ADX is showing weak sell signal. The price has reached the lower Bollinger band therefore the correction pattern may start soon targeting 1.28. The support level breakthrough may push the pair down towards 1.266.